Is anyone among you suffering? He should pray. Is anyone in good spirits? He should sing praise. Is anyone among you sick? He should summon the presbyters of the church, and they should pray over him and anoint (him) with oil in the name of the Lord, and the prayer of faith will save the sick person, and the Lord will raise him up. If he has committed any sins, he will be forgiven. Therefore, confess your sins to one another and pray for one another, that you may be healed. The fervent prayer of a righteous person is very powerful. As the sacrament of reconciliation; this is another sacrament of healing of body and soul. Illness can lead to anguish, self-absorption, sometimes even despair and revolt against God. It can also make a person more mature, helping him discern in his life what is not essential so that he can turn toward that which is. 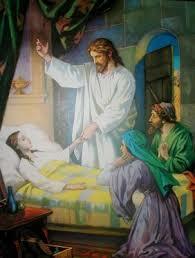 Very often illness provokes a search for God and a return to him. (Catechism 1500, 1501). Who receives this Sacrament of Healing? The Church teaches us in the catechism that the Anointing of the Sick “IS NOT a sacrament for those ONLY who are at the point of DEATH. Hence, as soon as anyone of the faithful begins to be in danger of death from sickness or old age, the fitting time for him to receive this sacrament has certainly already arrived.” Therefore, the sacrament of the sick is one where the believer is strengthened by the holy oils and prayers with Christ’s grace. If you think that you or any member of your family is in danger of death, or seriously ill or for any emergency; please call the parish office.